Sometimes the best way to do great design is to NOT be a designer. Fresh eyes. Fewer rules. This is one of the most famous pieces of graphic design from the last century. It’s the London Tube Map designed by Henry (often referred to as ‘Harry’) Beck in 1931. It’s remarkable for a lot of reasons. Firstly, Henry was never trained as a designer. He was employed as a technical draftsman by the railways, and only took to composing his map as a personal project. His managers didn’t like it initially. Secondly, it’s remarkable for how crisp and modern it still looks today. Created at a time when most homes don’t even own a radio yet, Beck’s map looks positively computer-generated. Each line runs either parallel to the page edges, or at precisely 45 degrees to them. Stations are evenly spaced and all bends and forks are geometrically perfect. Of course, the real-world rail system it records was nothing like this. Railways lines are built whereever it is cheapest and most practicall for humans to put them. Earlier maps blended road and city information with accurate track and station renderings. They look like a knot of colorful, fighting spiders. Henry’s new map actually transmitted much less information than the Tube maps that preceded his. Surely it’s be better to have more information, right? For the previous 500 years, mapmaking had been obsessed with fidelity. With good reason too! The more accurately you could reflect true positions and distances, the more likely your ship, crew and cargo made it home safely. But railways maps are different. There are more knowns. Trains rarely get lost en route and you can’t easily change lines or hop off between stations. Most stations are underground so there are few landmarks to see. He realized passengers mostly needed to know where stations were in relation to each other. His map is a blend of the simple structures we like in lists, and some of the useful spatial information we have in maps. In our world of web analytics and endless oceans of data, it’s easy to become obsessed with data and detail. If a little data is good, more must be better, right? Beck’s design genius wasn’t what he illustrated. It was what he chose to cut out. He removed a lot of information that was perfectly useful in its own right, but created a better overall result in the process. That should be an important idea to us. 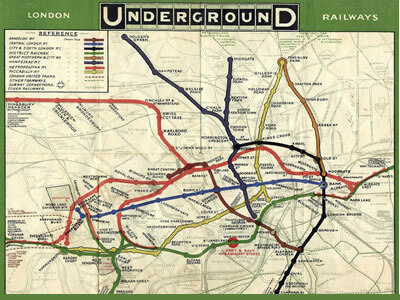 Beck certainly wasn’t the first to simplify a railway map, but it was his design that influenced designers up to this day.It was a roaring success from the start and Henry continued producing it till the 1960’s. When I was researching this piece, I came across an interesting picture on Flickr. It's a superstylized golf course map from 1931 -- but for a golf game. 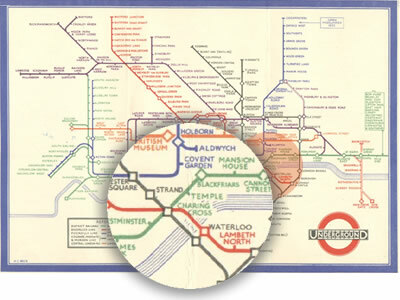 It's actually slightly older than Beck's Tube map. I'm trying to find out more about it. I like the style of that tube map, but despite not being able to do math or tell time well, I'm a physically spatial person and am more comfortable knowing/seeing/feeling distances, directions and where things actually are. So as I use a system I end up trying to make something more like the second "realistic" map somewhere eventually. "Henry was never trained as a designer. He was employed as a technical draftsman by the railways"
His map looks exactly like a technical draft. Looks like circuit schematics. It sounds like they mean "Henry was never trained in art." Draftsmen design, in my view. Thanks for such interesting read! Though Beck was not a designer, but he tried to find out way to show many things in little. today Henry’s map is one of the most loved design tropes — continually referenced in design to this day. It is incredible that a non-designer person who designed map in 1931 is still use for reference. Interesting. I don't profess to be an expert in drafting, but I always got the impression it was more about 'technical recording' than design -- like a stenographer brings a set of skills to a job, but not necessarily the skill of creative writing. I seem to remember it was still an apprenticeship trade when I was at school (80s) where as architecture was a full degree. Regardless, Mr Beck certainly lacked nothing in the design field.